IHA reconnected with digital lifestyle expert Carley Knobloch, to learn about the latest trends and products that she will discuss at the 2018 International Home + Housewares Show. At the Show, the Innovation Theater will feature 21 presentations over four days. Topics discussed will include smart home, consumer shopping preferences, branding and global market trends. Carley Knobloch is on a mission to help people improve their relationship with technology, one tap or swipe at a time. She’s a gadget guru, helping people use technology that helps them save time, money and sanity and a regular fixture on Today with Kathie Lee & Hoda and KTLA in Los Angeles. She’s also HGTV’s smart home expert, where she helps audiences make sense of emerging home technology in an easy, approachable way. Recently her “Pretty Smart Home” was featured in the pages of Good Housekeeping. Carley became a life coach in 2006 and helped her clients who were stressed, disorganized, and wanted to simply live smarter. Downloading an app or learning a new piece of software was often the answer, so she focused her energy on helping even more people navigate the digital world through her website, CarleyK.com, and her Webby-nominated YouTube show, Digitwirl. Carley has been featured in Real Simple, Allure, and Bloomberg Businessweek. She resides in Los Angeles with her husband, two kids, springer spaniel, and myriad smartphones. Carley, what is the most exciting or rewarding part of your work? What fuels your inspiration? To me, a truly smart home is as beautiful as it is intelligent— the gadgets fade into the background and you just feel like life is easier. There’s nothing like watching the little lightbulb in someone’s brain illuminate when I’ve made a tech struggle make sense. I’ve been a lifelong teacher, and I never tire of helping someone solve a problem. In 2007, I was a life coach and my clients were a roster of busy, successful women. When the iPhone was released, every one of my clients had one immediately, and all turned to me to help them figure out how best to use it to run their life. To me, that was the moment when the personal technology era started, and I became a resource for them to make sense of the ever-evolving world of technology around them. In the past few years, what has changed most in your business? How you been able to meet these challenges in the way you work? I’m so lucky that my work has pretty much stayed the same but increased in scale and scope over the last few years! I’ve always been a storyteller that brands have leveraged to share their products with a busy, female market. Even in 2018, how to speak to women eludes many tech brands (not all, of course, but many!). So much of what I do is help brands communicate their story in a female-focused, lifestyle-oriented way. We’ve been shooting so much more of our own photography too— brands love seeing their gadgets styled in a softer, more lived-in homescape. Housewares is an exciting space right now— connected devices are going to make our lives so much easier, but consumers are still wary, confused and unsure about what’s out there and how it benefits them. I’m proud to be working with the Show to create the second annual Smart Home pavilion (right outside the Wired & Well hall!) to showcase some of the coolest technology in the connected home space. I’ll be speaking about connected kitchens, which is the space that’s really exploding right now in terms of interest and innovation. Again, consumers are intrigued but also concerned about things like privacy, complexity… and price. I’m going to be contemplating the human’s role in the smart kitchen, and how we might feel when robots handle most of the chore of getting dinner ready! In my work, I am mostly speaking to consumers— everyday people who aren’t steeped in technology, trends and innovations. It’s fun to speak to some of the biggest and most influential manufacturers and brands en masse, and let them know what consumers are thinking and feeling about what’s hitting the market. I get to communicate the anxieties, the hopes and the wish list of their target market! Privacy, complexity and price. And the unknown… what is worth investing in? What will be here in 5, 10, or 20 years? And what will really make a positive impact in my life? I think it’s how retailers and manufacturers respond to the above: Transparency when it comes to data collection, ease of use and set-up, a commitment to security, and solving real problems for the consumer at home. Thanks, Carley, for sharing your thoughts with us. You make it sound so easy! We look forward to hearing some of your insider tips on how things can work at home, even when we’re not there! 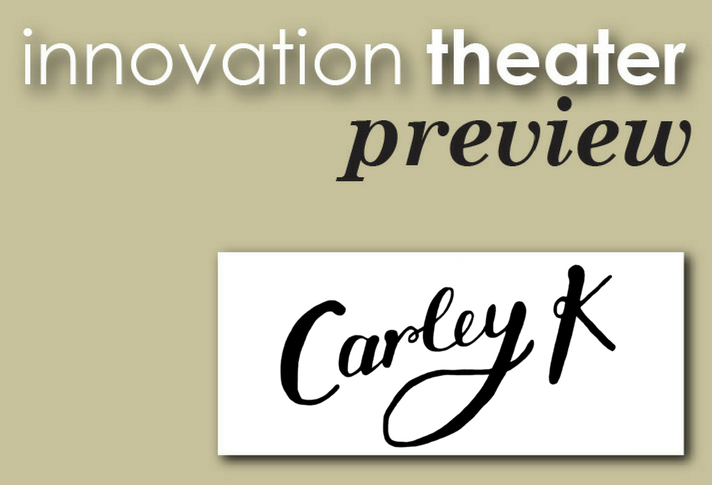 Be sure to attend Carley Knobloch’s presentation Sunday, March 11 2:30 pm in the Innovation Theater. Carley will also appear in the Smart Home pavilion on the Smart Talks stage on Sunday at 10:30 a.m. and 12:30 p.m., and Monday at 10:30 am. To learn more, visit her website and find her on Twitter and Instagram.